Four Massachusetts Congregations are Committed - More Welcome! In February, a delegation from the Massachusetts Conference UCC will travel to Chile to participate in the Annual Meeting of the Pentecostal Church of Chile (IPC) and to inaugurate new sister church relationships between UCC congregations in Massachusetts and IPC congregations in Chile. The IPC has given priority to six churches to partner with UCC congregations in Massachusetts. To date, four congregations in the Mass Conference have committed to this project: United Parish of Lunenburg, Athol Congregational, Central Congregational in Newburyport, and First Congregational Church of Sheffield. Each Massachusetts congregation will partner with an individual church in Chile. The Sister Church Project of the Mission Partnership is the latest expression of a thirty-plus year covenantal relationship between the IPC and the MACUCC. 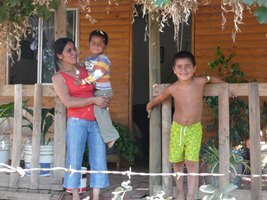 It builds on the success of Levanta la Esperanza, the Lifting Up Hope Campaign which was initiated, implemented, and completed by the IPC to provide Casitas de Bendición (Blessing Cabins) to 300 Chilean families who lost their homes in the earthquake and tsunami of February 2010. The Sister Church Project continues to strengthen the existing relationship and will increase a sense of community through the construction of buildings for use by congregations of the Pentecostal Church of Chile. Each “sister” church in Massachusetts is asked to raise APPROXIMATELY $5,000 over the course of three years. All participating churches are expected to communicate regularly through email and social media, to share parish concerns and to pray regularly for each other. Participants from the Massachusetts churches will also have the opportunity to visit their sister congregations in Chile in a delegation.